Complete Vegetable Spiralizer Bundle Just $14.84! Down From $40! You are here: Home / Great Deals / Amazon Deals / Complete Vegetable Spiralizer Bundle Just $14.84! Down From $40! We have another awesome deal for you! At Amazon, you can get this Complete Vegetable Spiralizer Bundle for just $14.84 down from $39.99 PLUS FREE shipping with Amazon Prime or for orders over $25! With the Kitchen Supreme Spiralizer you can create lower-calorie versions of some of your favorite dishes by substituting high-carb meals with amazing veggie noodles. Prepare the same recipes you love so much, with the same texture and taste, but with much more minerals and nutrients. Be your own Chef and enjoy a tasty Happy & Healthy Meal! 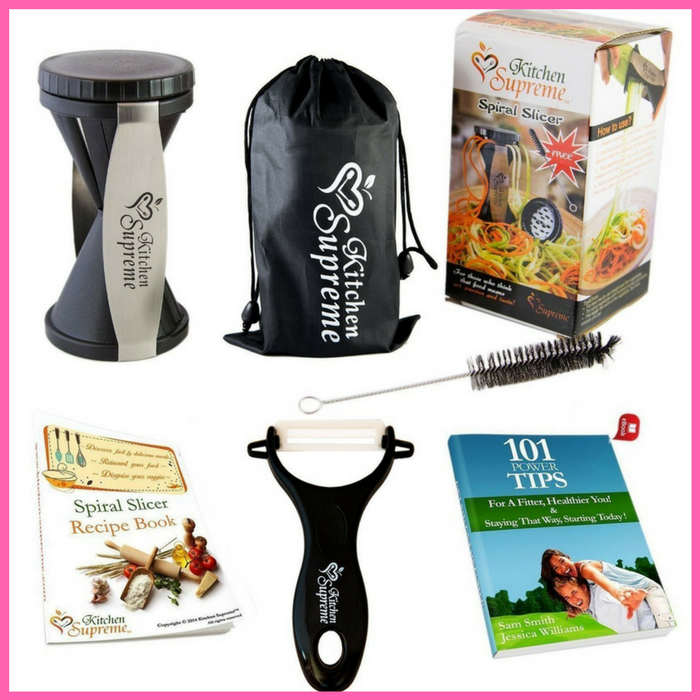 SUPERIOR VALUE for the Complete Vegetable Spiralizer Bundle: The Kitchen Supreme Spiralizer + Ceramic Peeler + Flexible Cleaning Brush + Storage/Protective Bag + Spiral Slicer Recipes Physical Cookbook + Rapid Results Digital Guidebook – 101 Power Tips for a Fitter, Healthier You! VERSATILE: Create NOODLES and JULIENNE SPIRALS. CONVENIENT & USER FRIENDLY: Comes assembled and ready to use ! No Annoying Extra Attachment to set up, that take up your space and time. It’s Dishwasher safe and Compact, easily stored in the kitchen drawer. Super-easy to use!